A double from Alfie Rutherford and Wes Fogden’s opener ensured the holders eased into the semi-finals of the competition at Westleigh Park. Lee Bradbury’s side took the lead after 26 minutes when Rory Williams’ cross was cleared as far as Fogden, who drilled his shot into the net. 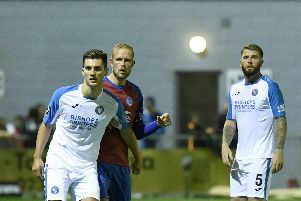 To their credit, the Wessex League premier division visitors did threaten to equalise before half-time, with home keeper Ben Dudzinski pulling off a couple of decent saves. The Hawks increased their advantage in the 61st minute when Nicke Kabamba’s shot could only be parried by the Solent keeper, with Rutherford snaffling home the rebound. And the striker notched his second of the game 11 minutes before full-time when he finished with aplomb from just inside the area. Fareham Town were unable to join the Hawks in the last four, however, after being dispatched 7-0 by Basingstoke Town at Cams Alders. Ben Wright and Sam Smart bagged braces for the Southern League premier division south visitors. Sam Deadfield, Zidan Akers and Dean Stow piled more misery on the Reds. In the Wessex League Cup, Baffins Milton Rovers advanced into the last four. The premier division club delivered a 4-0 victory over division one side Alton.